It is common in multithreaded programming to require one thread to wait for another thread to take some action. 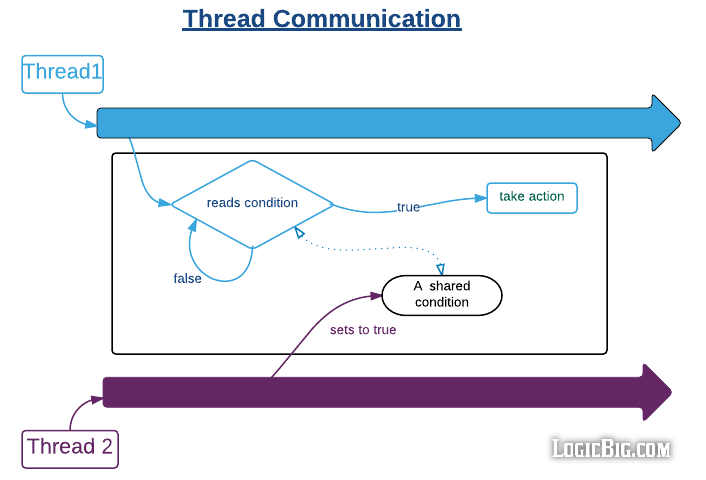 Semantically, there's no direct thread communication possible as per underlying thread model, instead a developer can use some condition based on a shared variable to achieve the inter-thread communication. The above thread1's while loop is known as 'Guarded Blocks', but that's not an efficient solution as this loop is just wasting CPU cycles also we cannot avoid thread interference . Java extends it's 'intrinsic lock' model to provide a better solution, i.e. by using java.lang.Object methods wait() and notify()/notifyAll(). All these Object's method calls are redirected to native methods, that means this mechanism is inherently provided by underlying operating system. wait() causes the current thread to wait (blocks or suspends execution) until another thread invokes the notify() method or the notifyAll() method for this object. wait() method throws InterruptedException - If the corresponding thread calls interrupt() then the waiting state will get interrupted (just like sleep() method). The interrupted status of the current thread is cleared when this exception is thrown. Unlike sleep method which doesn't release the 'intrinsic lock', this method releases the 'intrinsic lock'. That means other threads have opportunity to execute other synchronized blocks/methods while this thread is in waiting state, which is good for overall performance. Also this method call will throw IllegalMonitorStateException if the current thread is not the owner of the object's monitor (the intrinsic lock). That's the reason we used synchronized block in the above example. notify() wakes up a single thread that is waiting on this object's monitor (intrinsic lock). If multiple threads are waiting then only one of them will get notified or will wake up; which thread will be notified, we cannot predict, that totally depends on the scheduler. notifyAll() will cause all threads to wake up if they are in waiting state due to wait() call. Since notify() and notifyAll() are also called from synchronized method/blocks: waiting thread will not start executing till the thread which calls these methods releases the lock.